WASHINGTON, D.C. -- U.S. small-business owners are less optimistic about business conditions now than they have been over the past year. 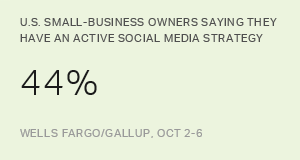 The Wells Fargo/Gallup Small Business Index, which measures small-business owners' attitudes about a wide variety of factors affecting their businesses, is down to +106 in Quarter 1, 2019, from the record high of +129 set in Quarter 4, 2018. The current drop erases the gains in confidence seen in the last two quarters of 2018 and returns the index to where it was from Quarter 3, 2017, through Quarter 2, 2018. 45% of owners reported that their revenues increased "a lot" or "a little," down significantly from 55% last quarter. Fewer owners now (55%) than in the previous quarter (62%) expect their revenue to increase "a lot" or "a little" in the coming months. Owners also became more negative when assessing their current cash flow -- with 66% saying it is "very" or "somewhat" good compared with 74% last quarter. The survey also explored small-business owners' views of their preparedness should there be an economic downturn or recession. Owners are generally optimistic about their ability to weather new economic problems. More than three-quarters of owners (77%) reported being either "very" (25%) or "somewhat" (52%) prepared to handle a downturn. Nearly seven in 10 owners reported owning their business 10 years ago during the recession. Among this group, 75% said they were better prepared if an economic downturn occurs now than they were over 10 years ago. 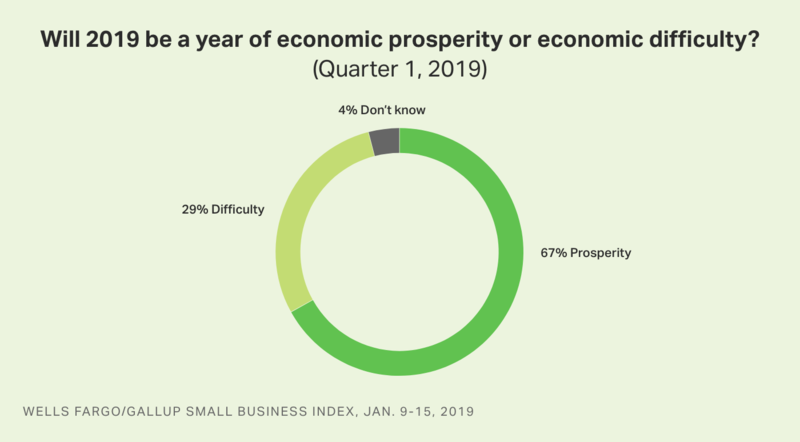 Despite the decline in their overall optimism about their business, when asked to think more broadly about the economy, two-thirds of owners say that 2019 will be a year of economic prosperity rather than a year of economic difficulty. 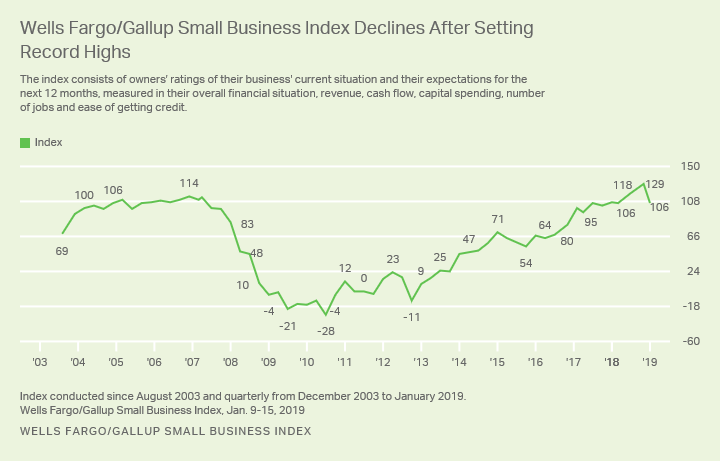 Amid a government shut-down, small-business owners' financial optimism has declined significantly from the high points reached last year, although optimism is still well above the levels measured in the years during and after the recession. Despite the continued health of the economy based on government indicators, owners this quarter are significantly less likely than previously to give positive ratings to their revenues and cash flow. The majority of small-business owners were in charge of their businesses during the recession ten years ago, and they clearly learned from that experience. Among those who owned their business at that time, many reported they have become more careful with their business finances. Three-quarters of owners who had their businesses during the recession say they feel better prepared for another downturn now than they were then. Results are based on telephone interviews with a random sample of 603 U.S. small-business owners in all 50 states, conducted Jan. 9-15, 2019. For results based on the total sample of small-business owners, the margin of sampling error is ±4 percentage points at the 95% confidence level. Is the Growing Uber-Economy a Threat to Small Businesses? Some small businesses see the on-demand trend as a way to help run their enterprises. 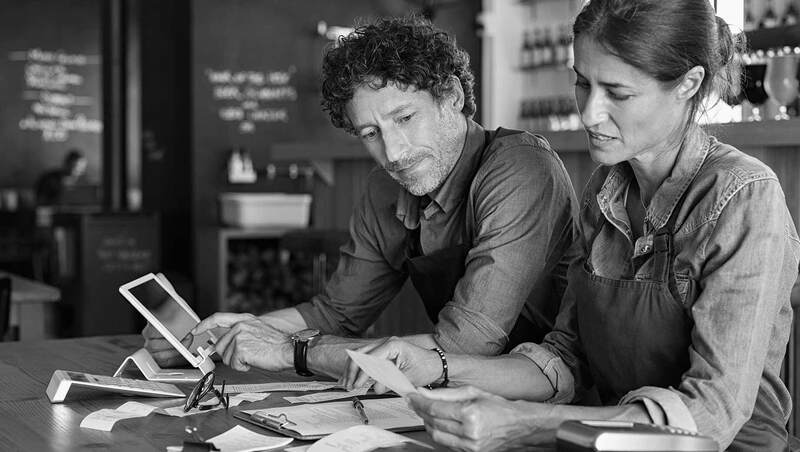 Three-quarters of U.S. small-business owners believe they will have enough money to live comfortably if they retire, although half would continue working even if money were no object.